Board certified nurse practitioner specializing in the non-operative treatment of hip and knee arthritis, sports medicine and fractures, and general orthopaedics; also manages orthopaedic patients during inpatient hospitalization. Sees patients at Bellona office and inpatients at University of Maryland St. Joseph Medical Center. Elizabeth Brannan is a Board-Certified Adult Acute Care Nurse Practitioner (CRNP) who specializes in the non-operative treatment of hip and knee joint arthritis, sports medicine, fracture care, and general orthopaedics. Elizabeth earned her undergraduate degree from Wofford College (Spartanburg, SC), where she worked as a student athletic trainer for the football team, and went on to complete her Master’s degree at Vanderbilt University as an Adult Acute Care Nurse Practitioner. Elizabeth has worked in both orthopaedics and emergency medicine. In addition, she completed an additional program to provide assistance as a surgical assitant in the operating room. She evaluates and treats acute to chronic orthopaedic related injuries. 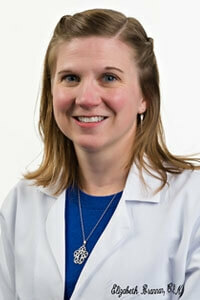 She also manages post-operative orthopaedic patients at University of Maryland St. Joseph Medical Center. She assists with medical management and orthopaedic mangement of the post-operative patient, and performs orthopaedic consults.